Google has taken its Street View cameras to Loch Ness to capture the famous lake from above and below water, as well as unveiling a Nessie Doodle on its homepage and a new Loch Ness Monster cartoon on its maps. 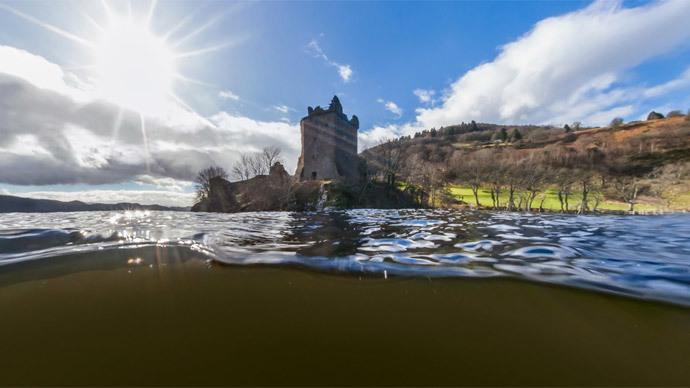 With the help of local divers and experts, Google has used its Street View cameras to photograph the lake to celebrate the 81st anniversary of the famous photograph of Nessie published in the Daily Mail by Colonel Robert Wilson. The image, known as the ‘Surgeon’s Photograph’, was later revealed to be a hoax. Google spent just a week taking one of its 40Ib (18kg) Street View Trekker cameras around the perimeter of the loch and on a boat; it also teamed up with Catlin Seaview Survey for the underwater shots. And for those who want to explore the area by Loch Ness on foot there will now be a little Nessie-like peg monster to replace the yellow peg character normally seen. But Google’s efforts appear rather halfhearted compared to the conservation pioneer Sir Peter Scott, who spent 15 years in the 1960s and ‘70s trying to find evidence of the monster. In 1962 Scott set up the Loch Ness Investigation Bureau with some like-minded colleagues at the House of Commons in London. They used a number of techniques considered modern at the time, such as sonar transducers, time lapse cameras and strobe flash lighting to try and capture the monster under water. There was also what became known as the ‘Gargoyle Shot’ of a large head with horny protrusions and another photo of what Scott thought was the entire creature, both taken in 1975. These were taken by a team connected to Scott, led by Rines. These pictures were dismissed in 1987 as sunken logs and other debris from trees and plants which surround the loch. But Rines and his team went to some effort to avoid any underwater debris, knowing that the loch was full of it. He deployed an underwater camera with a high powered flood light and as soon as any movement was picked up on the sonar then they would turn the lights on and take some pictures. According to Scott’s biographer Elspeth Huxley, these photographs convinced him that the monster was real and he and Rines named it Nessistteras rhombopteryx, or the Ness monster with a diamond-shaped fin.